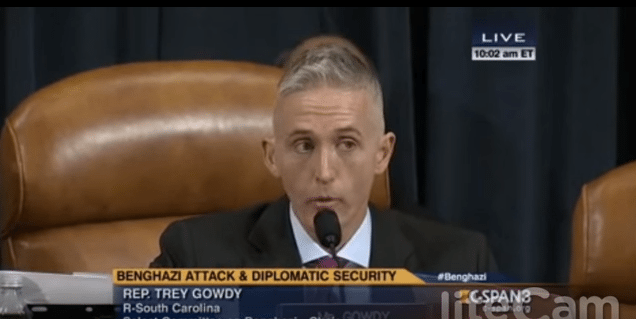 Okay, my fellow Americans, if you missed the Benghazi Committee stud, one Rep. Trey Gowdy of South Carolina, giving his opening arguments…oh, wait, this isn’t a trial, it’s a show hearing…statement, here it is. This is frankly, the most concise and specific string of statements on what we the people have been wanting to know when it comes to Benghazi in a long time. Further analysis coming later today after the testimony itself is over. Rep. Cummings’ statements and Hillary’s are, frankly, a lot of posturing. More on that later. In the meantime, just know that so far at roughly noon, eastern time, no fireworks have happened, but one congresscritter DID take a leaf from the Darrell Issa playbook. (That was kind of funny.) There are definite strategies on both sides unfolding. Stay tuned.